MAXA Notifier is a Skype Add-On that notifies you about your individual contact's state changes and messages audibly. So you only need to be in hearing distance of your computer to be informed for expample as soon as important contacts become available or you know immediately who has sent you a message, and even the mesage can be read to you. Supports Wave, Midi and MP3 files and text to speech engine. A Skype Add-On that notifies you about Skype contact events audibly. How do you use MAXA Notifier for Skype? - Using the Text2Speech-Generator and just enter the text MAXA Notifier should read to you. Notifications can be set for each, individual contact and for different occasions. For example, you can easily set the MSN to notify you when people come online, offline, send a message, etc. Additionally, you can specify whether you want to have a message box shown to you. This can be useful to track everything that has happened while you were away. Check Blogs updates without opening your browser. Check the latest updates for your installed applications. Be informed of the new email messages arriving from multiple email accounts. PayPal Notifier automatically check the new payments from PayPal. Skype to phone and phone to Skype. Never miss a Skype call again. Application for image transformation and animation in real time. Perfect, professional looking web forms in minutes. Validation and totals. 1099 W2 Forms Software for filing & printing W2 Forms and 1099 Forms. 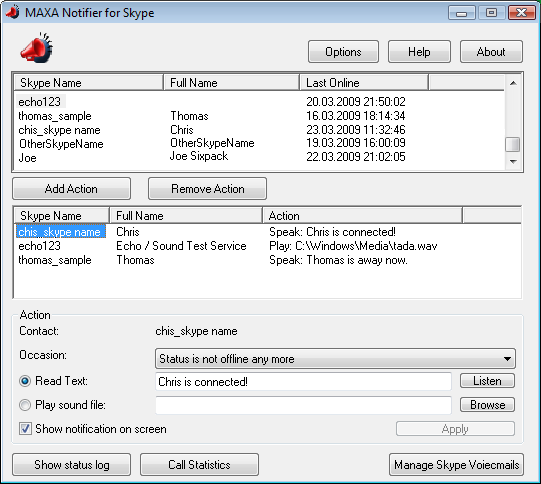 Qweas is providing links to MAXA Notifier for Skype 1.3 as a courtesy, and makes no representations regarding MAXA Notifier for Skype or any other applications or any information related thereto. Any questions, complaints or claims regarding this application MAXA Notifier for Skype 1.3 must be directed to the appropriate software vendor. You may click the publisher link of MAXA Notifier for Skype on the top of this page to get more details about the vendor.